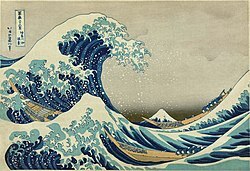 The Great Wave off Kanagawa is a woodblock print made by Hokusai. The art work was printed somewhere between 1830 and 1833 which was during the Edo period. It is the first print in the series, Thirty-six Views of Mount Fuji. It shows a giant wave threatening boats near the Japanese prefecture of Kanagawa. It was made with the ukiyo-e printing technique. Metropolitan Museum of Art (MMA), "The Great Wave at Kanagawa"
This page was last changed on 31 August 2017, at 13:17.